There is a lot going on in the sky on the weekend of March 18-20, 2011. 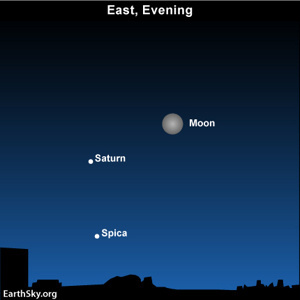 The moon will be near a bright planet (Saturn) and some bright stars (Regulus and Spica). Plus there will be an especially close full moon – which some are now calling a supermoon – which might mean higher-than-usual tides, especially if the weather gets stormy along coastlines. High tide alert this weekend due to perigee full moon. The full moon of March 19 is the closest full moon of 2011. Astronomers call this a perigee full moon, because the moon is full while also at perigee (from “peri” or “near” and “geo” or “earth”). However, in 2011, people have begun calling this sort of close full moon a supermoon. Thanks to this close full moon, you should look for especially high tides throughout the world this weekend. At every full moon – when the Earth, sun, and moon are lined up in space – the gravity of the sun and moon reinforce each other, and the tides are particularly high. At the perigee full moon, or supermoon, of March 19, 2011, the moon will be both full and nearby, so high tides should be at their highest (and low tides at their lowest). Storms have a large potential to accentuate the tides, so if you live on a coast, and a storm is coming this weekend, be prepared for possible flooding. At nightfall and early evening Friday night, look for the full-looking waxing gibbous moon in front of constellation Leo the Lion in your eastern sky. The moonlit glare will wipe out many of the Lion’s stars tonight, but you should be able to make out Regulus, Leo’s brightest star. 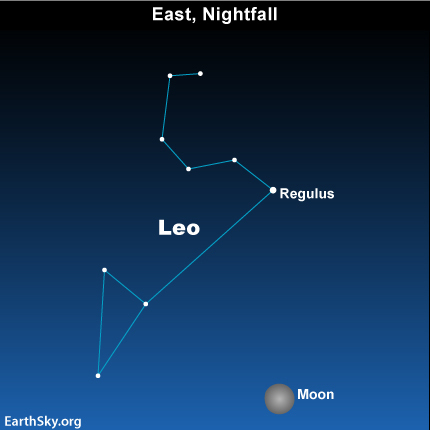 At mid-northern latitudes, you will see Regulus above the moon this Friday evening. At middle latitudes in the southern hemisphere, Regulus appears to the left or upper left of the moon. The moon is also near the planet Saturn tonight – and the moon and Saturn will be even closer tomorrow night. Watch for the moon closest to Saturn for this month on Saturday evening. Saturn is now only two weeks away from its 2011 opposition – when we will be closest to the ringed planet for this year. Opposition just means that, as seen from Earth, Saturn and the sun will be opposite each other. Saturn will be rising in the east as the sun sets in the west. This happens around the time we pass between Saturn and the sun each year, and it marks the best time to see Saturn in the night sky. March comes in like a Lion. By the way, that constellation near Friday night’s moon – Leo the Lion – figures into an old saying about springtime. In the northern hemisphere, the month of March is said to come in like a lion and go out like a lamb. That saying refers to March weather, but the same phrase can be applied to March constellations. The constellation Leo the Lion is ascending in the east on March evenings, and the constellation Aries the Ram is descending in the west. The Lion is coming in as the Ram is going out.